Wonder-child. That magical prefix that gets attached to any teenager showing remarkable ability in his/her chosen field. WUNDERKIND. Wonder-child. That magical prefix that gets attached to any teenager showing remarkable ability in his/her chosen field. Mathematics, science, computers, music and so on. However, for one particular speciality, that phrase attains greater meaning. Sport. Last week, Indian cricket—an area which has seen its fair share of ‘next (insert name of any of the plethora of great Indian cricketers who have played for the country here)’—had a new entrant to this list. Prithvi Shaw. Sure, people had been bigging him up to be the ‘Next Sachin Tendulkar’ since he was 12 but October 4, 2018, was when the prophecy was put to its first big test. Needless to say, the Mumbaikar passed it with flying colours. The 18-year-old, during his debut 134 against the visiting West Indies at Rajkot, reminded viewers of a young Tendulkar. Grip, balance, understanding the 360-degree nature of a cricket field and the hedonistic display of batsmanship—seven of his first 17 scoring shots were boundaries—was a throwback to the Tendulkar era of the nineties when the curly-haired sensation routinely composed haiku with a bat in hand. But—there is always a but in this context— nobody will be able to predict how many runs or centuries Shaw will go on to make. He may not score any more centuries or could have already scored one more even before the ink on this paper printed becomes dry (the second Test at Hyderabad began on Friday). That’s the essential nature of a child prodigy, it’s very difficult to predict their future. In an Indian context, this becomes even more problematic because of the associated external factors—insensitive public, mindless hysteria and a competition for places so tight that it seems Darwinism is at play right across the food chain. It’s for this reason why examples of the light flickering all too briefly is littered through the annals of India’s epic cricketing history. Of the 13 players to have played in Tests before turning 19, only four (Tendulkar, Ravi Shastri, Harbhajan Singh and Bhagwat Chandrasekhar) have played over 50 Tests. At least two (Maninder Singh and Laxman Sivaramakrishnan) of the missing nine were considered as children of a supreme god when they were presented their Indian caps for the first time. But their potential, for one reason or other, failed on the biggest stage of them all. Shaw has never faced this problem because his progression from one level to the next has been so seamless that it’s almost like his script is being written by himself. People first started looking at him when he was just nine years old. Since then, he has scored a 546 in the Harris Shield (a prestigious meet for Mumbai school teams), scored a 100 in both Ranji and Duleep Trophy debuts apart from skippering India to victory in the Under-19 World Cup. The next step in the growing-up process is safeguarding himself from ‘burnout’. It is another aspect which may be the undoing of a gifted athlete. One of the most famous 21st century instances of this example is Missy Franklin, who was touted to become the prince of the swimming pool. As a 17-year-old, she roared to four gold medals at the London Olympics. Six years later, she is just one of the many to have fallen out of love with the sport. From the next Michael Phelps (an actual title bestowed upon her by a number of Western publications), her journey to the depths made international headlines after she failed to make the USA team earlier this year. The same can be said of Vinod Kambli, who made his debut 11 days after turning 21. Four 100s, two of them doubles, in his first eight innings brought about Bradmanesque numbers. In the next 13 innings, he made more zeroes (three) than 50s (two) to promptly fall off the radar. The rise was remarkable. The fall defied the laws of physics. Why is preventing burnout so crucial to the fortunes of a young athlete? Divya Jain, a sport and counselling psychologist who recently gave a talk to the Indian contingent who left for the Youth Olympic Games, explains. “The performance of a youngster can dip suddenly for two reasons,” she says. “If he/she fails to make the transition from the sub-junior to the junior level or junior to the senior level. That’s very common. But burnout is something entirely different. Singh sings the same tune. “When you don’t do well, even if you are only 18, there is no space for you (to grow). If that happens, you start trying too hard and more often than not, things tend to go awry.” That support system—with brother Ajit forming the backbone—was the key behind Tendulkar’s journey from uncut gem to 24-carat gold. How Shaw handles the next few months and years will reveal a lot more about him than what happened on October 4. He merely did what many had predicted six years ago. Can he now translate this start into something more meaningful? That’s the real challenge and will form the next chapter in one of Indian cricket’s foremost wunderkinds at the moment. Drew applauds for his late vigil to save his debut game. Not a finished story yet. Dropped for poor keeping when he was still to turn 19, he was one of those whose best years coincided with MS Dhoni’s. Competing with Dinesh Karthik and then against Wriddhiman Saha after Dhoni’s retirement, he has not been able to grab his chances after Dhoni’s retirement. Fourth on the list of youngest Test debutants, he is the only one in the top 10 to have played more than 100 Tests. Mushtaq Mohammed is next with 57. The other eight played an average of 11.2 Tests between them. If not anything else, it shows that exceptional talent can facilitate an early beginning, but it hardly assures a long career. The biggest example in cricket of performance matching promise. Like Prithivi Shaw, was representing India in age-group events while well below those limits. 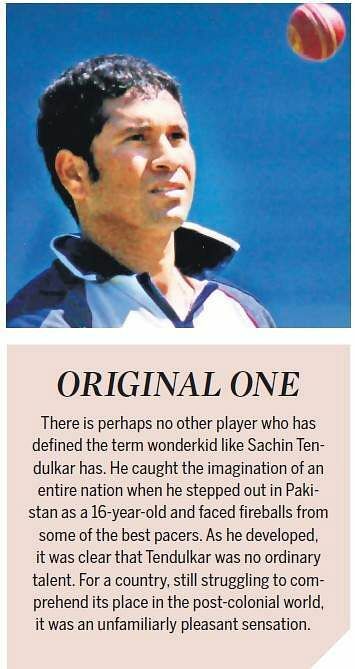 A googly that cleaned up Sachin Tendulkar in the Challenger Series in 2005 had pundits speaking highly of this precocious talent. But the leg-spinner was found wanting after being handed a Test cap in 2006. Even in the one-day team he never became a regular. Counting the IPL riches, his career has perhaps been successful. But considering the talent that threw him into international cricket at such a young age, Chawla is one of those what could have been stories. Despite 88 Test wickets and playing his part in victories, here is another story of not-so-smooth sailing after an early take-off. Described as worthy successor of the great Bishan Singh Bedi, this sardar who represented Delhi was an impressive beginner. Classical action, attacking approach and electric fielding made him an exciting player to watch, in spite of his rather unflattering batting. For a period in the eighties, he was a regular for India in both formats. That’s when it went wrong. It has not been well recorded why, the left-armer’s bowling lost zip and he lost his place in the side to Venkatapathy Raju. An attempt to come back in ODIs ended on the dead tracks in Gwalior. India’s youngest Test debutant at the time. Three successive 6-wicket hauls in his second and third Tests, including two in a match-winning cause against England in Mumbai in 1984, heralded the beginning. A stellar performance in India’s successful campaign at the World Series Championship in Australia next year confirmed his stature as a rising star. But the leg-spinner’s international career soon took a downward turn which could not be reversed. He played his last international game before turning 22! He stuck around in domestic cricket for several years and even improved his batting considerably. Unfortunately, what was gone could not be revived.